Every time I reach the town, I see this texture error on the chain texture, even after an update (see uploaded Image). That sign in your picture has been altered by a mod. Check and make sure any mesh replacers you're using aren't broken. That sign is an otherwise vanilla blacksmith sign so you should have lots of them doing the same thing in other towns. 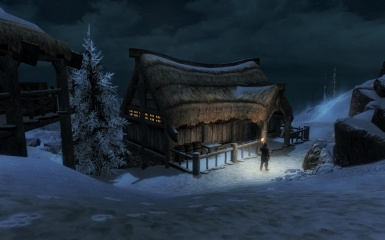 Mistake by me, it is not your mods town, it is Heljarchen town with Nightgate Inn, and only there. 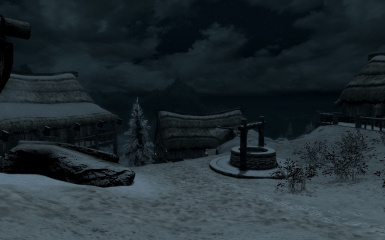 Is it compatible with ELE and Relighting Skyrim as well Lanterns of Skyrim mods? Would it be safe to add .esl flags to Helarchen Creek and your other town mods via xEdit? Not on an existing save, and not without compacting the IDs before you start a new save either. Given the number of people who have attempted this lately and ended up with broken games, I feel compelled to point out that compacting will also invalidate any patches made against a mod that's had it's IDs compacted after release. It's not a pretty thing to suddenly have a mod that was patching a rock become a mod that's now patching a building or an NPC because the form IDs don't align anymore. So I think it's best to amend my previous reply and say it's not safe to do this on anything that's already been released. Once again Arthmoor with the amazing mods. Geez you spoil us. Thanks. Thanks Arthmoor for your wonderful work! for most of your village enhancer mods you recommend to load them AFTER Immersive Citizens. However, many mods need to be placed *before* IC so that LOOT places IC'S .esp usually rather at the end, so your mods all(!) come before IC. Update LOOT then because you're using an old masterlist. This has since been corrected and IC is positioned properly. In the event it's not though, continue to follow the given advice and place ALL city, village, and town mods below IC so that IC can't disrupt their navmesh edits. Just updated LOOT, its master list AND checked with a clean install. If only IC and your mods are present, everything happens as described by you. If you have lots of mods Darkwater & Whistling mine goes under IS, Kynesgrove, Helarchen & Soljund's stay up way above IC. I also found 2 plugin lists on https://modwat.ch/ that showed the same (in your opinion wrong) behaviour. What effects to look for to see whether this is harmful or not? Honestly I don't know why LOOT hasn't made a towns & villages group to put stuff like this in because that's where it belongs and IC belongs in an early loading group. As I have said, many different times now, put IC before ALL OF THEM and you won't have a problem. There will be no issues to look for because you won't be having any. Hammet's Dungeon Packs for SE is now compatible, the location of the dungeon Fahl Mzund has been moved. Rejoice! LOOT is flagging this mod (2.0.4) as being incompatible with Hammet's Dungeon Packs for SE (1.87)? I'm guessing LOOT's masterlist will be updated at some point so as to reflect the former incompatibility no longer being applicable. Hi Arthmoor. I know you are basically the ultimate authority in all things skyrim, so no mere words can express the respect I have for you or for what you have done for this community. Thank you for all your tireless work and endless bugfixing! I have a question regarding this mod. I see it is not compatible with Hammet's dungeons due to the conflict with the one dungeon in particular. What would the consequences be of having both mods active? I currently have both active and have so far not had issues, although I have not been to the area where this conflict is yet. I do not know what to do. Do you have any advice? Edit: I just went to the area. Your mod is loaded below Hammet's Dungeons in my load order, thus I the village is present and the dungeon is not. The game did not break or crash, everything works (as well as it can in skyrim anyway). Edit 2: I'm an idiot. The dungeon is there and it works perfectly. I have no idea why these conflict other than the follower issue. I have both mods as well with Hammet's loaded first then Helarchen Creek and I can access both places. The dungeon is unaffected as far as I can tell, the entrance is just one of those elevator things that's hidden under the snow but still accessible. I have no idea what the issue is except for some red navmesh stuff in XEdit. Your followers won't follow you up the road to the dungeon, but if you use a follower mod you can just summon them to you. I suppose a patch could be needed to sort the navmesh stuff and remove the snow, but why bother if its all working? How important is navmesh stuff? There are no crashes, the dungeon is 100% accessible ( I cleared it and the exit is the entrance), and no one from the village goes up that road to get stuck in the navmesh stuff. What am I missing? 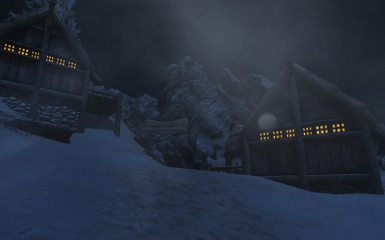 EDIT: I just looked at the pics for Hammet's Dungeons and Fahl Mzund is supposed to be covered in snow so that's not a problem, so just stubborn followers I guess. I do use a bashed patch, maybe that helps idk. Thanks for the information, I came here looking to see if anyone had already covered this and what the effects might be. As long as there are no crashes, and I can still have the extras, one dungeon missing won't bother me too much.